There are few circumstances in a person’s life that is as stressful and distressing as the death of a loved one. This can be even more disturbing in the case where challenging a will is necessary. A person’s last will and testament is his last wishes on how he wants his estate to be divided between surviving family members. However, this is by no means an ironclad declaration. There are instances when the will is challenged for any of a number of reasons. Some of the more common reasons for contesting a will are when a family member is not represented. Another fairly common reason for contesting a will is when there is doubt of its veracity, or the date it was written and signed. There have been cases of multiple wills having been drawn up and this may cause some problems, as to which is the most updated. Last Will and Testament concept image complete with spectacles and pen. Family lawyers or lawyers who specialize in family-related laws are usually given the task of drawing up the will. This may not be always the case, as some corporate lawyers may be kept on retainer by the founder of a corporation, for instance. Challenging a will in these cases can be messy if there are multiple corporations or entities involved with cross ownership and other corporate instruments involved. The rule of law is followed, of course, especially when it comes to estate taxes. However, this is also the reason for retaining the services of a lawyer who is an expert in settling estates. He would be the most knowledgeable in keeping taxes to a minimum, while giving family members and other stakeholders their due share. Besides drawing up the will, a will and estate lawyer has the unenviable task of reading the will and following its provenance. 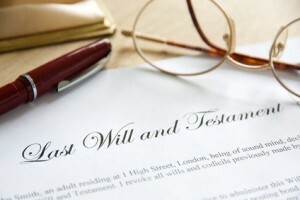 As far as the will is to be followed, the estate lawyer serves as the mediator and executor. He is tasked to follow the wishes of the deceased as laid down in the will. When contesting a will, a family provision barrister may be needed by close relatives who feel they have been left out of the will. There are instances when the will can be contested, and it should be emphasized that these are all set to law and there are precedents for this. An experienced lawyer will be able to argue for the inclusion of an interested person as long as there is a valid claim. These are issues that are better left to the court to decide.